Josie's Juice: 'Thrill By Mouth' - Nando's Charity Comedy Evening: Catherine Deveny interview. 'Thrill By Mouth' - Nando's Charity Comedy Evening: Catherine Deveny interview. 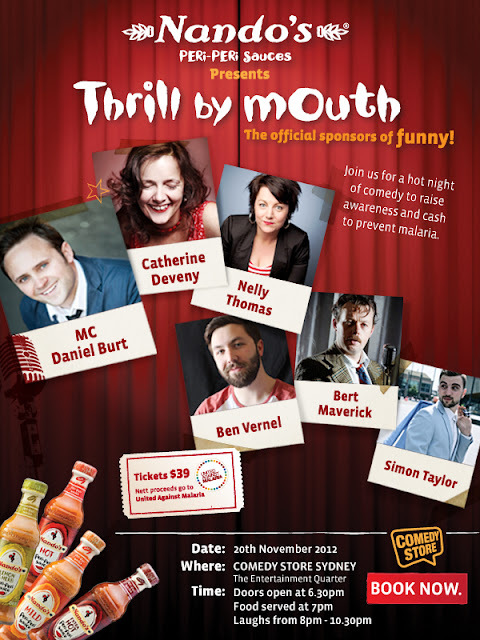 And so tomorrow night off I go to the Nando's Charity Comedy Event cleverly titled 'Thrill By Mouth'. Catherine Deveny [sold! ], Nelly Thomas, Ben Vernal & Bert Maverick, Simon Taylor, and MC Daniel Burt. Here's the best bit: Nando's Peri-Peri sauces [okay, no-kidding plug: I am NUTS about these sauces and may just have about four different ones in my pantry/fridge right now] is raising money from the event for United Against Malaria. All net ticket proceeds will go to the United Against Malaria global fund for malaria prevention efforts. And guess what? At only 39 bucks a pop, buying a ticket means you can make a positive difference and save lives in Africa. How damn good is that? Tell me why you got involved with this event? "Where do I start? What's not to love about making funny and gratuitous swearing with a bunch of buddies and astonishing comedians, in the sparkling city of Sydney? All wrapped up in hot sauce and helping to eradicate malaria. Malaria is one of the big global problems we are very close to solving. I'm absolutely sure my kids will die in a Australia that is a republic, that has legalised gay marriage and voluntary euthanasia, a science based drug policy in a world where malaria is a thing of the past. What do you hope people will get from the exposure this event and its cause will bring? People will have a bonza awesome top night. They will go away after a night of top night of gold rolled comedy delivered buy hot saucy performers and leave knowing they have made the world a slightly better place. And wondering why they don't go out and see stand up more!!! You made a huge impact on the ‘Go Back To Where You Came From’ series. Any future TV series in the pipeline for you? Nope. Just launched my first novel 'The Happiness Show' and that looks like it's going to be made into a film so that's the closest thing. I'm working on a my new one woman Melbourne Comedy Festival Show for 2013 called 'Curvy Crumpet.' Also working on a new book for Christmas 2013."